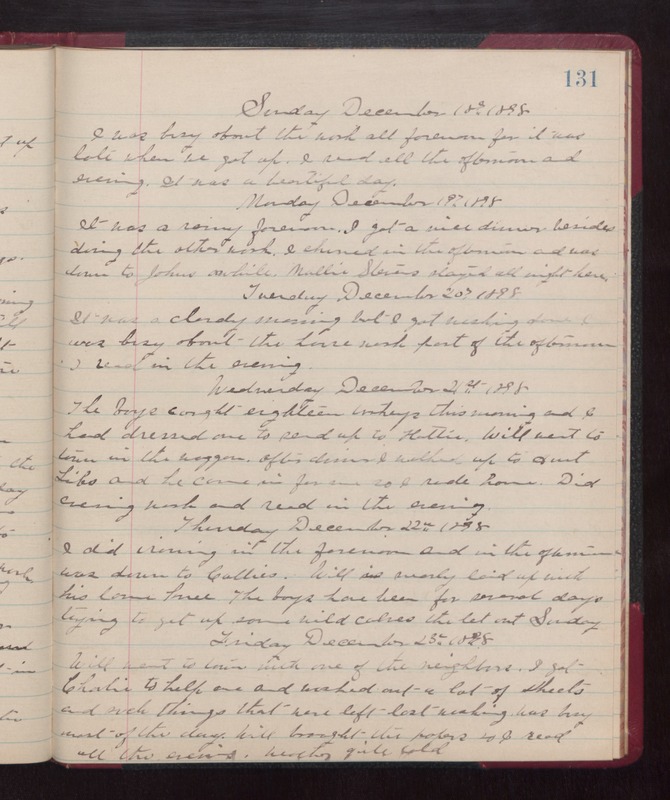 Sunday December 18th 1898 I was busy about the work all forenoon for it was late when we got up. I read all the afternoon and evening. It was a beautiful day. Monday December 19th 1898 It was a rainy forenoon. I got a nice dinner besides doing the other work. I churned in the afternoon and was down to Johns awhile. Mollie Stevens stayed all night here. Tuesday December 20th 1898 It was a cloudy morning but I got washing done. I was busy about the house work part of the afternoon. I read in the evening. Wednesday December 21st 1898 The boys caught eighteen turkeys this morning and I had dressed one to send up to Hattie. Will went to town in the waggon. After dinner I walked up to Aunt Libs and he came in for me so I rode home. Did evening work and red in the evening. Friday December 22nd 1898 I did ironing in the forenoon and in the afternoon was down to Callies. Will is nearly laid up with his lame knee. The boys have been for several days trying to get up some wild calves the let out Sunday. Friday December 23rd 1898 Will went to town with one of the neighbors. I got Charlie to help me and washed out a lot of sheets and such things that were left last washing. was buys most of the day, Will brought the papers so I read all the evening. weather quite cold.